House Cleanout & Junk Removal Lansdowne, Pa.
Just before the gripping cold weather arrived our junk removal and house cleanout teams completed a couple of projects in Lansdowne, Pa. We sent two junk disposal truck crews to the job and both worked in tandeum to complete a house cleanout for a family relocating, a garage cleanout which went fast and a smaller basement cleanout. If you live in Lansdowne, Pa. area and your looking for a professional junk removal service give Philly Junk a call. 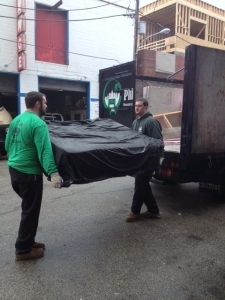 We come in and remove unwanted items right where they sit, load and haul away. Record Setting House Cleanout In Germantown, Pa.
PhillyJunk junk removal trucks keep rolling completing trash removal jobs for families moving and relocating all throughout the Philadelphia area. This time of the year we begin to see an increase in household moves for a variety of reasons. In almost every case families accumulate trash and junk over the years which they don’t want to take with them when packing and moving. So, that’s when we receive the calls. Our junk and trash disposal teams will come in and remove whatever you need right where it sits. Sometimes people search for trash removal companies in Philadelphia and other times junk removal companies in Philadelelphia. In many cases they just want some old furniture removed or the basement cleaned out. Whatever the circumtstance give Philly Junk a call and we will be happy to schedule your junk removal or trash removal job for you.